Parking & Transportation | Conference Services, U.Va. Conferences@UVA works in conjunction with Parking & Transportation to handle most aspects of traveling around Grounds and the surrounding areas, including bus service, parking permits and visitor parking, traffic control officers, and charter service. University Transit Service moves passengers quickly and efficiently throughout Grounds. Buses run every 10-15 minutes during the academic year and every 30 minutes during the summer weeks, although the schedule varies on holidays and weekends. 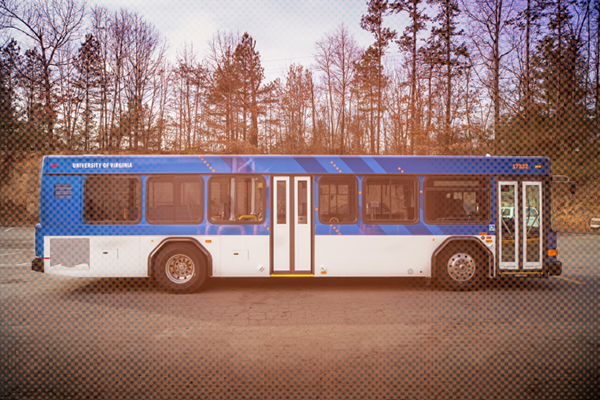 The University's bus service is offered at no charge to passengers, as is the Charlottesville Free Trolley, which passes through Grounds and loops through Downtown Charlottesville. Bus schedules delineating routes and times are available at Parking and Transportation's website. You can also view the TransLoc real-time transit map with bus arrival predictions online, or visit http://uva.transloc.com/info/mobile#app to download the mobile app for iPhone, Android, or Blackberry. To view the web version of the real-time map on a mobile device, please go to http://uva.transloc.com/m/. In order to park at the University of Virginia, guests need to display a parking permit. The permit allows guests to park in a specific lot for the duration of their stay. This lot is determined by the meeting, event or housing location. CONFERENCE GUESTS: Please contact your conference program representative to learn what your parking options are. EVENT PLANNERS: Conferences@UVA can assist you in determining what parking options are available to your group and will obtain the necessary permits you require. In order to ensure the smooth flow of traffic at large check-ins or especially busy days, traffic control officers are available. Conferences@UVA will help planners determine whether traffic officers may be needed, and will work with Parking and Transportation to obtain this support if necessary. Parking & Transportation offers a number of charter possibilities for your program. Depending upon the size of your group and the length of the trip, Parking and Transportation can offer minibuses, transit buses, minivans, coaches, and driver services. Vehicles equipped with wheelchair lifts are available. If you you would like to rent a vehicle while staying at the University, Conferences@UVA can provide you with information on local vehicle rental agencies.